India has a long and storied tradition of art, tracing its origin back to pre-historic settlements in the third millennium. Nearly every civilization that has since occupied the sub-continent for any span of time has left an indelible mark on its culture and artistic consciousness. So has every major religion that rose from its soil or arrived from elsewhere and stayed,and Hinduism, Buddhism, Jainism and Christianity have had major influence in how the divine element was interpreted and portrayed in art. Over its own course of development, each religion furnished the artist with the iconographic models that over centuries crystallized into a unique argot of devotional iconography. 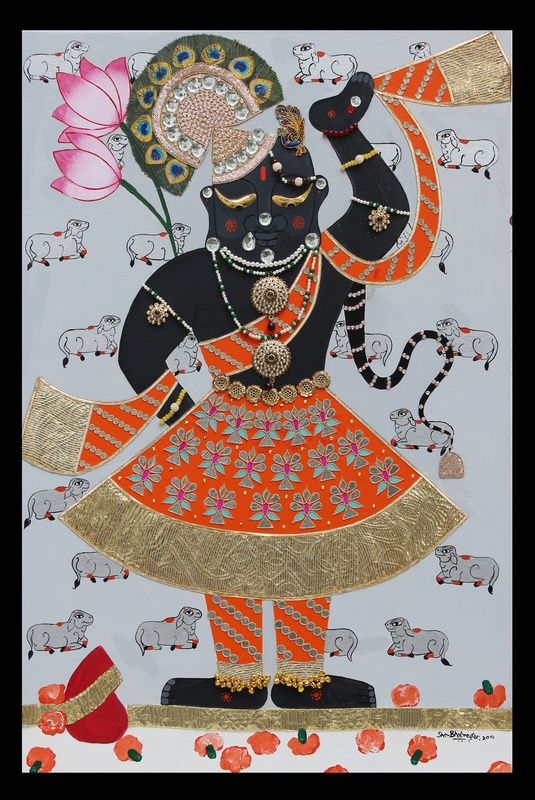 One prominent example is the Pichwai -paintings in the Mughal miniatures’ tradition originating from the Shrinathji Temple in Nathdwara, Rajasthan. 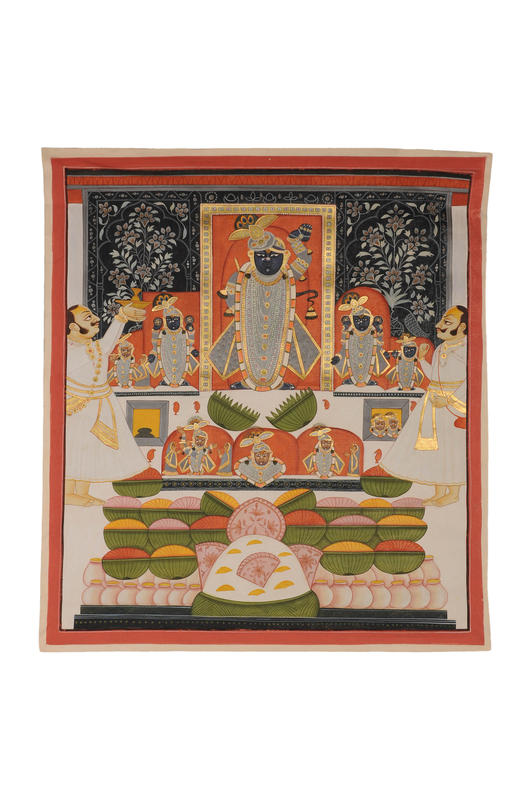 Celebrating Srinathji – the infant incarnation of Lord Krishna, these mesmerizing, hand painted cloth screens were originally designed to serve as a backdrop (hence the name) to the idol of Srinathji at the Nathdwara Temple. 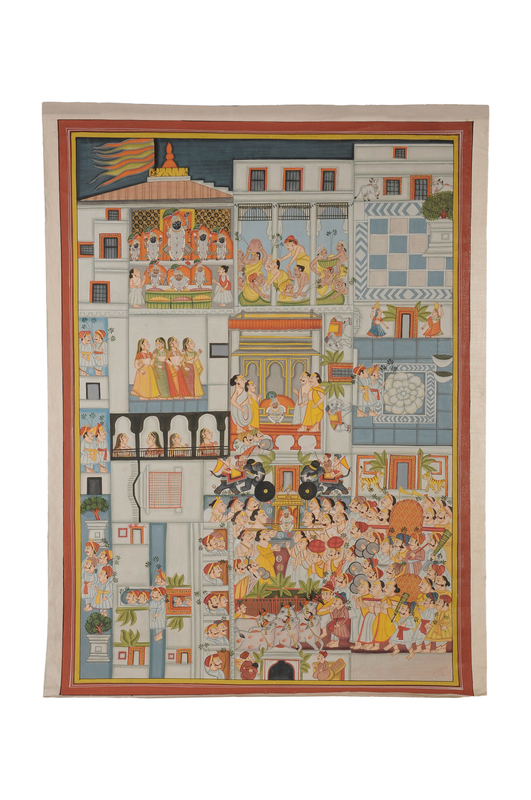 Devotees often carried a Pichwai back from Nathdwara with them as a tangible form of the popular Hindu god and slowly the Pichwais became highly prized souvenir art. Another interesting example of religion leading to art is the “Mata – ni – Pachedi” which was also used as backdrop to temple idols of Shakti in Gujarat, where these richly coloured pieces originated as wall paintings. Harijans, or the members of lower castes, who were not allowed in these temples solved the problem by making ‘Mata-ni-Pachedis’ on cloth and using them in shrines in their homes. Once again, a devotional form of art moved out of its definitive space into a larger one making it accessible to more people. 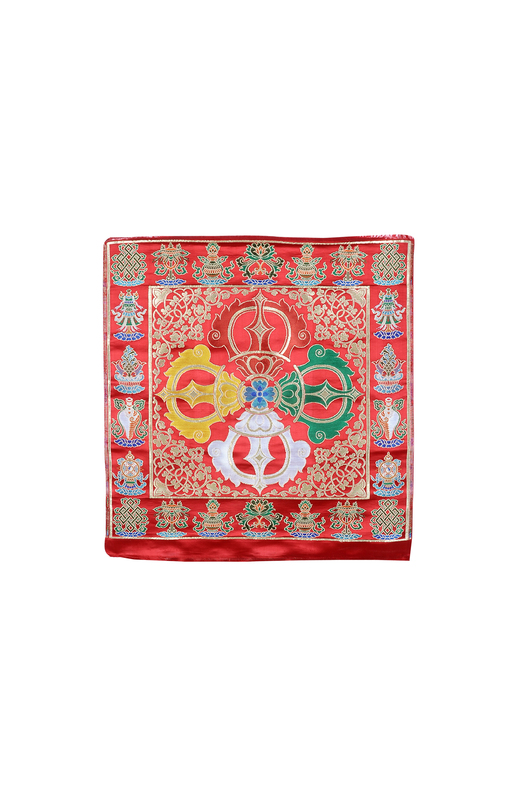 The Gyasars, once made only for kings and Buddhist clergy, replicate this narrative closely as does the Thangka. Life finds a way as did these living arts. And for these incredible textiles to go on living, this mutation from fixed definitions to a larger palette must continue. And it is happening. 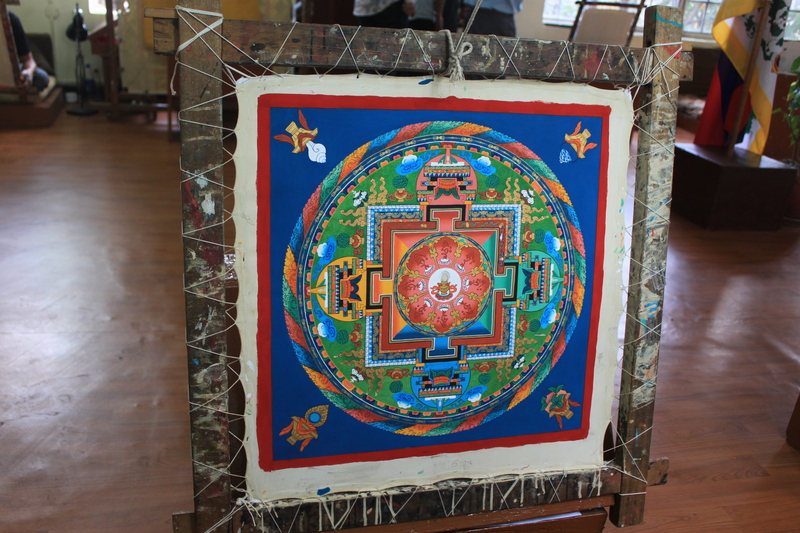 Creative designers are using Pichwais as wall art to brighten up a corner in a room; a framed “Mata – ni – Pachedi” blazing a living room wall becomes a conversation starter; a Gyasar Brocades becomes wall art and everyone wants a Thangka. Given the intrinsic artistic value of these textiles, it isn’t difficult to include them in a home’s interior design. These are harmonious textiles, never disturbing the balance of an existing design, only enhancing it. There has also been support from the Government and that was the initial fillip to this segment. As noted textile & fashion designer, Mayank Mansingh Kaul puts it, “ The initial stimulus to such efforts came from the landmark series of textile exhibitions as part of the ‘Festival of India’ in the 1980s. What we are seeing today is a culmination of those efforts and these arts today have established themselves as secular art forms coveted for their intrinsic aesthetic values.”. 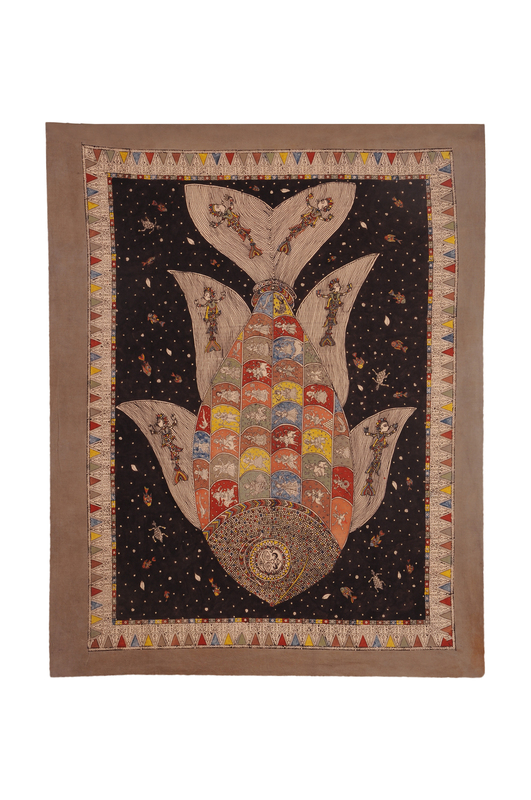 Pichwais, Gyasar and Mata-ni-Pachedi, all emerging from ritualistic requirements for a religion are now found on cushion covers, wall paintings, coasters and other products of functional use. 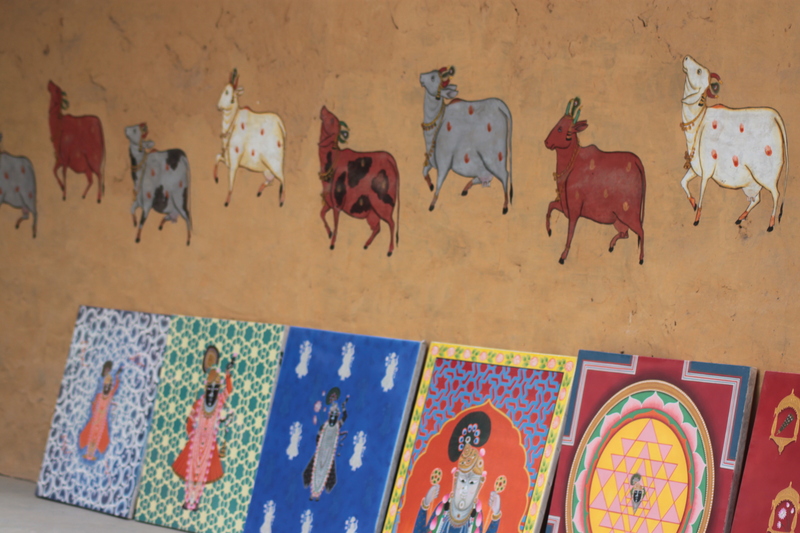 This movement into everyday life and evolution to functional uses is the new narrative for devotional art.Delhi based Kamayani Jalan, a prominent Pichwai expert says, “ The journey of Pichwai, from the backdrop of the temple to the wall of a living room has been very interesting. The religiosity of Pichwai is slowly getting converted to an art form. And by being a piece of art instead of a religious deity, the quest to posses it, has become much more.The contemporary form of this art, which is a result of this journey, has been attracting more of the younger generation to it. It’s a living art and will continue to be one”. Consider the fact that these decorative devices used in places of worship were once commissioned by kings and royalty and received immense patronage from them; not the case anymore and with a lack of resources to create them and without a market to sell them, these art forms will wither away in the spaces of time. The only way these languishing arts can be revived is by giving them a new avenue to breathe. Expanding their definitions and providing them a larger arena to play on is the only way ahead. The relevance of these textile arts in contemporary Indian life will be the shot in the arm the Pichwais and Mata-ni-Pachedis so badly need. In coming together to revive these languishing textiles, we would have saved a thing of beauty and made it a joy forever. Image References: A Contemporary Rendering of a Pichwai by Shan Bhatnagar & Contemporary Style of Pichwai by Studio Kishangarh. This article was first published in POOL Magazine. Posted in Art, Artist, Crafts, fashion, Incredible India, India, inspiration, Jaypore, Rajasthan, Textiles, traditional, Wondrous India and tagged art, Artist, beautiful, contemporary, Culture, devotional, fashion, Gyasar, India, Jaypore, Love, Mata ni Pachedi, paintings, Pichwai, rajasthan, Royal, temple, Textiles, Thangka, Tradition, unique. Bookmark the permalink.